England v Greece World Cup Qualifier at Old Trafford 6th October 2001. As an international star and media sensation, David Beckham is synonymous with English football. As a player he combined dead-ball brilliance and phenomenal passing vision with an outstanding work ethic and professionalism. Beckham’s profile was not just built on media hype, but on the foundations of exceptional ability and determination. On the opening day of the 1996/7 Premier League season, a promising 21 year old lobbed Wimbledon goalkeeper Neil Sullivan from the half-way line. Commentator John Motson breathlessly described the hit as ‘absolutely phenomenal’; an apt description of the boy from Leytonstone. David Beckham had made his entrance. While the football world sat up and noticed Beckham after that goal, the key staff and players at Manchester United had been watching his talent grow for some years. A member of the feted 'Class Of 92' side that won the FA Youth Cup in 1992, Beckham's first team debut had come as a League Cup substitute almost 5 years prior to the Wimbledon moment. He was playing Champions' League and Premier League football as a teenager, and established himself in the Premier League and FA Cup double-winning team of 1995-96. Manchester United player David Beckham May 1999 with the Champions League Cup trophy after his team beat Bayern Munich 2-1 to win the UEFA Champions Cup final at the Nou Camp Stadium in Barcelona. Pic via Mirrorpix. His career went from strength to strength. He became a first-team regular on the right side of midfield and helped his side retain the League title in 1996-7. Beckham’s contribution was recognised when he was voted PFA Young Player of the Year 1998-9. The year of the ‘Treble’ (United won the Champions’ League, Premier League and FA Cup), was perhaps the highlight of Beckham’s United career; with his set-piece deliveries leading to both goals in the Champions’ League final. United continued to grow and flourish with Beckham being instrumental throughout. The relationship between Beckham and his long-term manager Sir Alex Ferguson began to deteriorate, however, around the turn of the century and in 2000 he was fined two weeks’ wages. Notably Beckham was also accidentally struck in the face by a football boot kicked by his manager. In 2003 he became the latest galáctico at Real Madrid in Spain. He helped the team to win La Liga and the Spanish Super Cup before making the move to America’s MLS, and LA Galaxy, where Beckham’s profile as a global sporting superstar helped raise the profile of the US game internationally. Following a final loan move to Paris St Germain he became the first British player to win titles in four countries. Simple facts speak volume – throughout his career Beckham won a phenomenal 6 Premier League titles, 2 FA cups, 4 Community Shields, a Champions League title, 2 MLS Cups (USA), The Ligue title (France) and La Liga (Spain). FA Cup Third Round match at Stamford Bridge. Chelsea 3 v Manchester United 5. 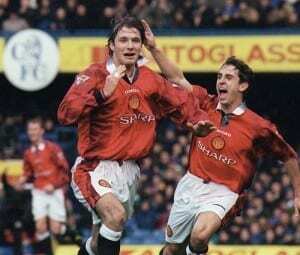 David Beckham celebrates his goal with teammate Gary Neville. Beckham’s England career was full of highs and lows. Portrayed as the villain when sent off for kicking out at Argentina's Diego Simeone in the 1998 World Cup in France, Beckham earned back respect through hard work and extraordinary talent. Perhaps the most memorable moment in the transformation from villain to hero was his last-minute free-kick against Greece, at Old Trafford. Needing a goal to automatically qualify for the 2002 World Cup, Beckham stepped up to take the free-kick and with the swing of his famous right foot, sent England fans wild with an unstoppable shot, curling into the top corner. He holds more caps (115) than any other England outfield player, and is the only English player to have scored in 3 separate World Cups. Beckham signed his first professional contract in 1992. When he left the game, 21 years later, he did so as one of the most famous sportsmen, and personalities, on the planet. From billboards to buses, ‘Brand Beckham’ is a multi-million empire. Throughout his playing career even his haircuts became front-page news and were copied in playgrounds across the world. While his fame led to some criticism, Beckham has put his status to good use. He became the face of charities such as UNICEF and Unite against AIDS. Beckham admirably has demonstrated how football can be used as a force for good. When all of the media hype is removed the simple fact remains that he was an ordinary boy, the son of a hairdresser and kitchen-fitter, who was passionate about the game. His discipline and determination saw him rise to be one of the footballing greats. It still remains that no-one can quite ‘Bend it like Beckham’.